I recall when the debate took place in the 80’s as to whether states should adapt a national holiday in honor of Dr. Martin Luther King Jr. I remember while in high school, students held a sit out because Oregon had not yet honored this day. I remember walking amidst the crowd of students with one of my favorite teachers, Chuck Wetherell. Flying home from Atlanta to Portland this past weekend, I sat next to Walter. Walter was an elderly African-American who spent his entire life in Portland, Oregon. He and his wife were preparing to move to Atlanta, Georgia. Together, we watched a football game on the screen located on the back of the seat in front of me. Together, we laughed and enjoyed each others company. With this, I cannot imagine a day where this could not happen. In this, I cannot believe that in this day and age, we still find racial inequality in that one set of people deem another set of people to be of lesser value. When do dreams come true? May it not be on our shoulders that another generation passes before this dream is fulfilled. For in this, may we all begin to see the character of others and no longer the color of their skin. And from this, let us begin to march boldly into the future… as one. 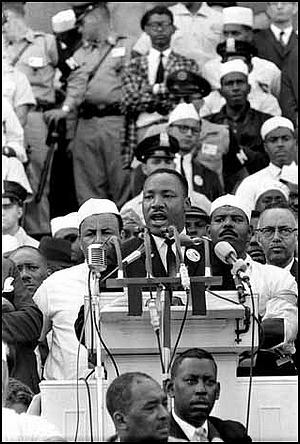 As I listen to “the” speech, I cannot help but to turn back the clock and imagine the impact others in the civil rights movement must have felt from it. For in it was a man pointing people to a brighter future. A future reached through perseverance, discipline, and the willingness to dare to dream. Has this hope for a brighter future yet drawn nigh? Has not this dream found its time to become unlocked from the hearts and minds of the many and ushered forth into the reality of the daily walk? The daily walk not that of one people, but that of all people… hand in hand, in step, and with the voice of a choir of angels. What dream will you help unlock today? This week, I am proud to join These Numbers Have Faces in seeking to bring this dream and the dreams of the many to fruition. 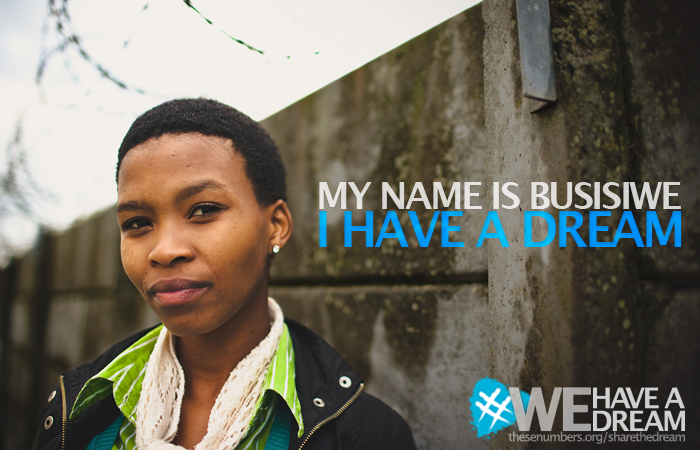 They are doing a campaign this week called “We Have A Dream,” spotlighting the amazing dreams of their scholars in South Africa. This is a young woman named Busisiswe. When she was 7 she lost her mother to HIV/AIDS. At 13 she lost her sister to gang violence. But through These Numbers Have Faces she persevered and is now studying accounting at a prestigious South African University. Her dream is to fight poverty in her community and change it for generations to come. Amazing. If you would, please share this image of this amazing young woman and her dreams for the future. In this, for all those who have never heard “the” speech, here it is. Do yourself a favor and listen, read, pause, and reflect. I have a dreamMartin Luther King Jr.What dreams will you unlock today?